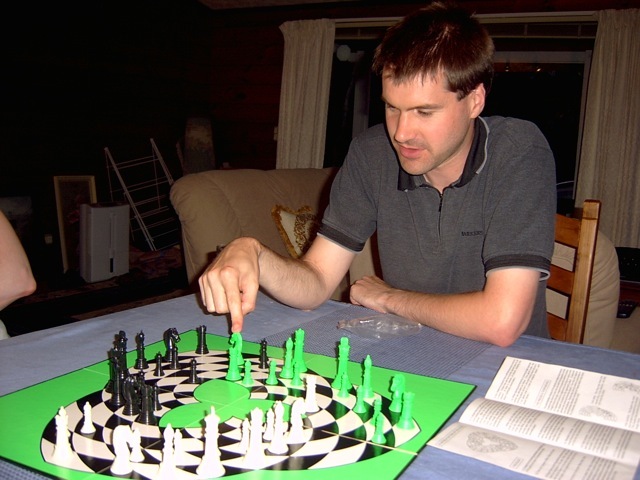 This is a picture of an unusual chess-based game called Trichotomy that my friend John owns. 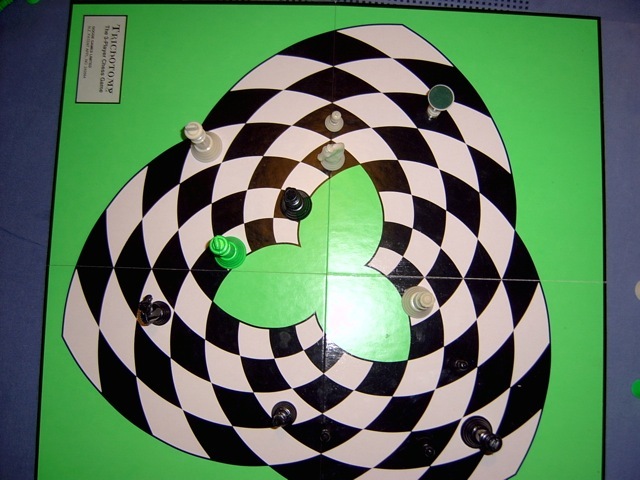 As the picture and the name suggest, Trichotomy is played with three players, each trying to checkmate the player to their left. John bought the game years ago from the designer himself, and I have never seen anything like it since. So what does it play like? Well, for one thing the games tend to get off to a brutal start. As you can see from the pictures, half of your back row is exposed to the person on your left who is trying to wipe you out. You must protect yourself as best as you can from the previous player while trying to get your pieces up into the ranks of the next player. Often alliances are necessary, but these tend to be short lived. 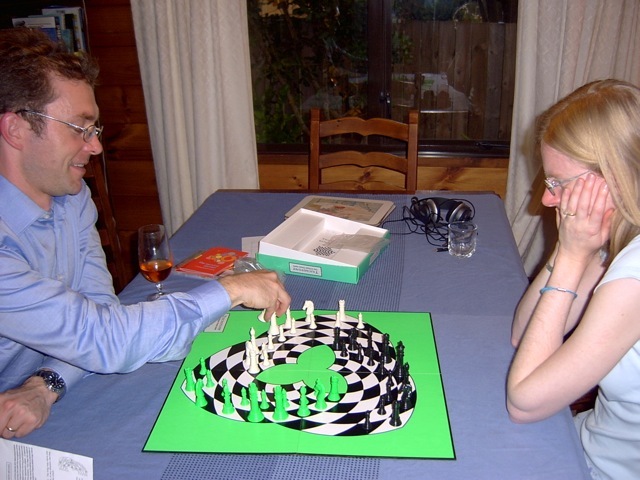 The rule that has the biggest effect on strategy is that while all three players are still in the game, you cannot make a move that would put the king of a player in check to the player in front of him. This means that it is possible (although rather risky) to use your king much more aggressively than in normal chess, using it as a impervious spoiler ahead of you until there are only two players left. "I haven't finished yet, I'm still touching it!" It is perfectly possible to move pieces backwards (except for the pawns). This actually serves to keep the game quite balanced, since if you do badly from the start (as I did in this game), the thinning of your ranks only serves to open up the previous player to pincer maneuvers from the next player attack both forwards and behind. You have to keep you wits about you, because the design of the board makes it a little tricky to see the legal moves, especially on the diagonals. It's actually possible to put a queen or bishop "into orbit", moving in a complete circle around the central hole. Promoting pawns happens more often in Trichotomy than normal chess, which is lucky because your major piece die with alarming regularity. 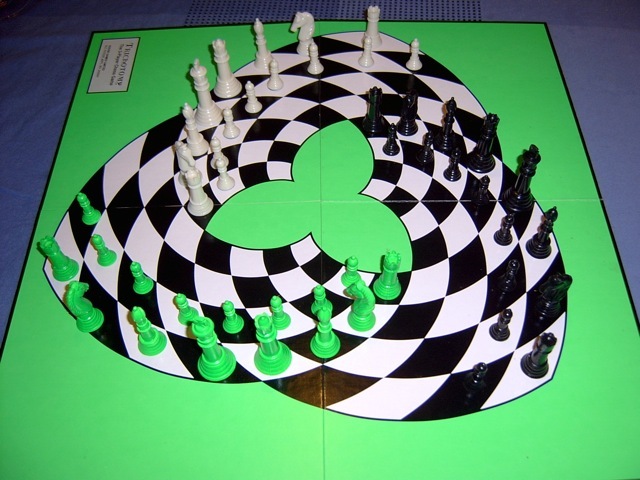 A pawn is promoted when it hits a border, although the half border two squares away from your starting row of pawns does not count, merely trapping your pawns there for the rest of the game. Forcing a pawn through the following player's ranks to get a second queen is one of the satisfying moments I have had with a board game. There are two traps that it is easy to fall into. It is possible to be sneakily checkmated if the following player moves so that your king is threatened by the previous player. Since it is not yet your turn, you cannot break the check and you lose immediately. Also, the fact that the following player cannot threaten your king, combined with a board that has twice the number of corners as usual means that there is a real risk of stalemate, which forces a draw. As with normal chess, this can allow you to retain a small amount of honor at the cost of the other players' undying hatred.